Santorini (pronounced [sando'reenee]), classically Thera ['theera]) is an island in the southern Aegean Sea, about 200 km (120 mi) southeast of Greece's mainland. It is the largest island of a small, circular archipelago which bears the same name and is the remnant of a volcanic caldera. Santorini is essentially what remains after an enormous volcanic explosion that destroyed the earliest settlements on a formerly single island, and created the current geological caldera. It is the most active volcanic centre in the South Aegean Volcanic Arc, though what remains today is chiefly a water-filled caldera. The volcanic arc is approximately 500 km (310 mi) long and 20 to 40 km (12 to 25 mi) wide. The region first became volcanically active around 3–4 million years ago, though volcanism on Thera began around 2 million years ago with the extrusion of dacitic lavas from vents around the Akrotiri. The island is the site of one of the largest volcanic eruptions in recorded history: the Minoan eruption (sometimes called the Thera eruption), which occurred some 3600 years ago at the height of the Minoan civilization. The eruption left a large caldera surrounded by volcanic ash deposits hundreds of meters deep and may have led indirectly to the collapse of the Minoan civilization on the island of Crete, 110 km (68 mi) to the south, through a gigantic tsunami. Another popular theory holds that the Thera eruption is the source of the legend of Atlantis. Firá is the picturesque capital of the island; perched high up on the edge of the Caldera, it looks like a marvelous painting. Firá, together with Oia, Imerovígli and Firostefáni located high above on a cliff, make up the so-called “Caldera’s eyebrow”, the balcony of Santorini, which offers an amazing view of the volcano. Santorini has been featured on numerous occasions in travel guides and recognized in contests related to tourism: National Geographic Traveler’s 50 tours of a lifetime, Tripadvisor’s Travelers’ Choice Awards, National Geographic Traveler’s Photo Contest, Conde Nast Traveler’s Gold List, Europe & Mediterranean Awards of Excellence, etc. Oia, a village at the Northern part of the island, is renowned for having the most spectacular sunsets in the world, while its volcanic-yet-romantic environment has provided the scenery for movie productions ranging from Lara Croft Tomb Raider: The Cradle of Life to Summer Lovers and The Sisterhood of the Traveling Pants. 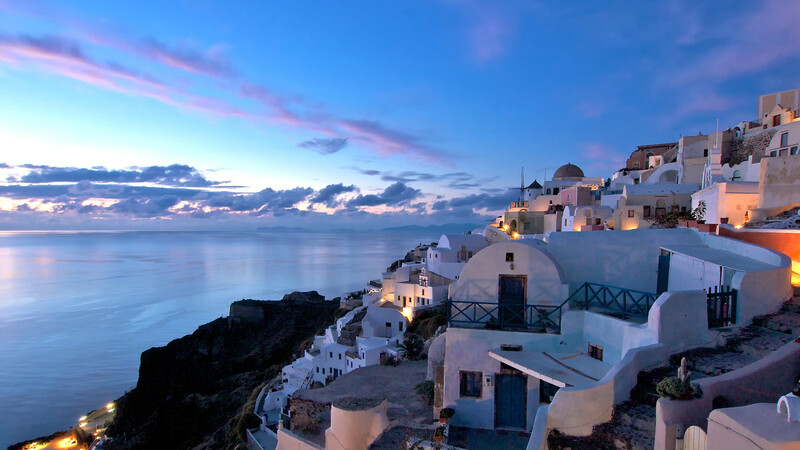 A visit to Santorini is the ultimate gastronomic experience, as the island is a true culinary paradise! Treat your taste buds to some famous traditional products like cherry tomatoes, white eggplants, fava, caper and “hloró tyrí”, a special kind of fresh goat cheese found on the island, or why not try some of the exceptional wines produced from grapes grown in the volcanic soil of the island! Assyrtiko, Athyri, Aidani, Mantilaria and Mavrotragano are just some of the distinctive varieties that you can taste at the island’s famous wineries (some of them operate as a museum as well) or at restaurants.